The wonderful world of jailbreaking contains more developers and designers than we could even begin to try and list. Even though a large portion of those individuals are frequently active within the community; experience has shown us time and time again that a handful of impressive and hard-working developers consistently push out imaginative and useful tweaks for those with jailbroken devices. Prominent developer Ryan Petrich is undoubtedly one of those guys and he is at it again with VideoPane, his latest release that adds to his growing portfolio of tweaks, utilities and frameworks. VideoPane is one of those great little tweaks that pretty much does exactly as the name suggests. No convoluted workflows that takes ages to implement and even longer to get your head around. No crammed in feature sets purely for the sake of adding more functionality. None of that. 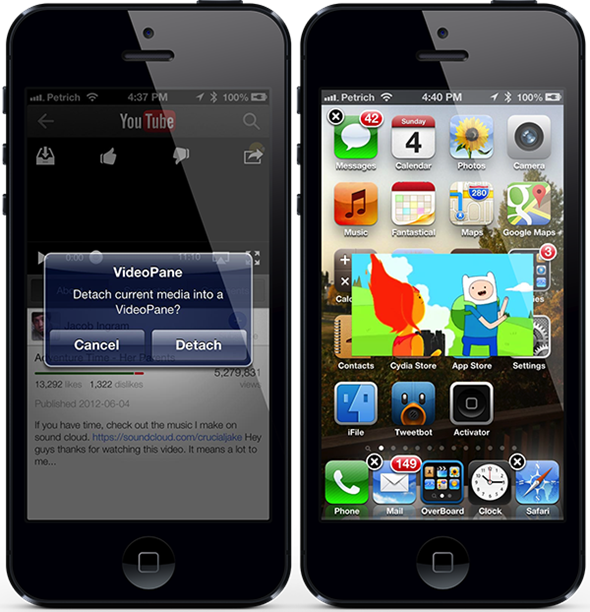 VideoPane is a Cydia package that concentrates purely on apps that allow the playback of video based media, allowing the user to detach that video from its application based player and house it in its own unique and useable container. Videos outside of their apps and inside of moveable containers? What jailbreak based black magic is this I hear you ask? Well, it actually makes perfect sense. Apps like YouTube, Facebook, Netflix and a plethora of others all allow users to watch and interact with movies and videos. However, they do it on their own terms by bundling a built-in movie player with their app. That’s all well and good and generally suitable for most use cases, but VideoPane applies a little additional power for those who might want to watch the video outside of the app or watch multiple videos together. Playing a video and then tapping a single button is all it takes to pop the video out of its normal resting place and into its own little comfortable container. The implementation is extremely good and exactly what you would expect from an experienced developer like Petrich. Being able to drop out of the app to the device’s home screen while still watching the video is also an extremely good advantage of VideoPane. VideoPane is available as a $1.99 download from the BigBoss repository with no specific iOS version requirements being given.